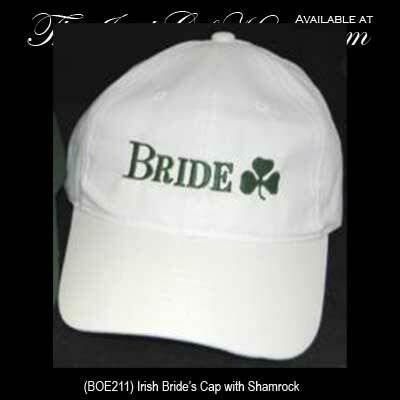 Irish bride's cap is a white design that features a green shamrock. This fun cap will help the Irish bride celebrate her wedding week and it will be fun to wear at the wedding rehearsal and during the honeymoon. This Irish cap features an embroidered green shamrock along with the word bride. The white cap is 100% cotton and it has a buckle adjustment for one size fits most accommodation. The Irish bride's cap is received with a shamrock history card, complements of The Irish Gift House. Irish groom's cap a green design that features a white shamrock.